Launchers Part 1 – Stock vs Big Launcher | 22 Point Blog! « Choosing an Android phone for low vision – Part 3: Brand and Android version. Big Launcher is the launcher I would recommend for most large print users. The launcher is the main part of Android you interact with when you are not in an app specifically. When you press the “home” key – you generally go to the launcher’s main home screen. The layout of the icons and widgets and how many home screens you can move between are all set by the launcher. You can’t change the launcher on the iPhone, but Android’s play store has many paid and free alternatives to the default launcher which comes with your handset. Below is a comparison between the default launcher and Big Launcher. In future posts I’ll cover some other options. While launchers vary from phone to phone, most stock launchers have a grid of 4 x 4 icons per screen, with a ‘dock’ of up to 5 permanent icons at the bottom. You can have multiple screens you swipe between. Some stock launchers (such as HTC’s) have issues with inaccessibility with Talkback. For straight Talkback use, Apex and Nova are both excellent replacements. Neither offers anything for large print unfortunately. Using this default launcher, even on my Galaxy Note II with its 5.5” screen, icons are, at most, barely 8mm square, which is not very big given the complexity of many app icons. The text labels on these icons are about 6pt – that’s only 2mm high. The list of all apps is a 5 x 5 layout. Default (Samsung) launcher with a big clock widget (Left) compared to Big Launcher (Right). Big Launcher gives you a home screen with two columns of four icons. A clock and battery indicator take up the top two positions on the first home screen, and you can add as many screens as you need. Icons are around 2cm high – 250% bigger than the default. Big Launcher also increases the font size of the contacts, call list, dialer, SMS and app lists as well as its own preferences, all up to 25pt. It comes pre-setup with the one page including an “SOS” button to immediately call or SMS someone. 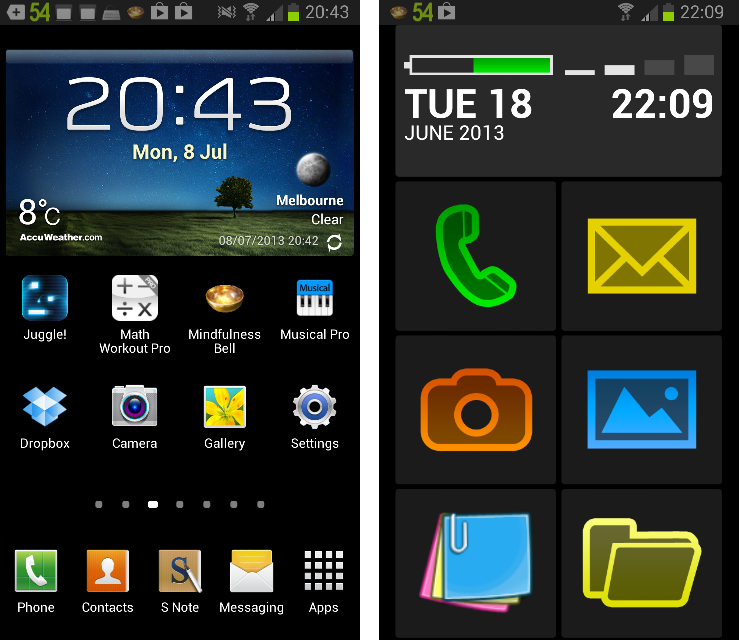 You can set the theme from light to dark or numerous colour themes and icon packs to match. I found you have to wade through menus a bit to setup multiple pages and populate them, but once done it’s a fantastic experience to use. You can also use 1×1 widgets. 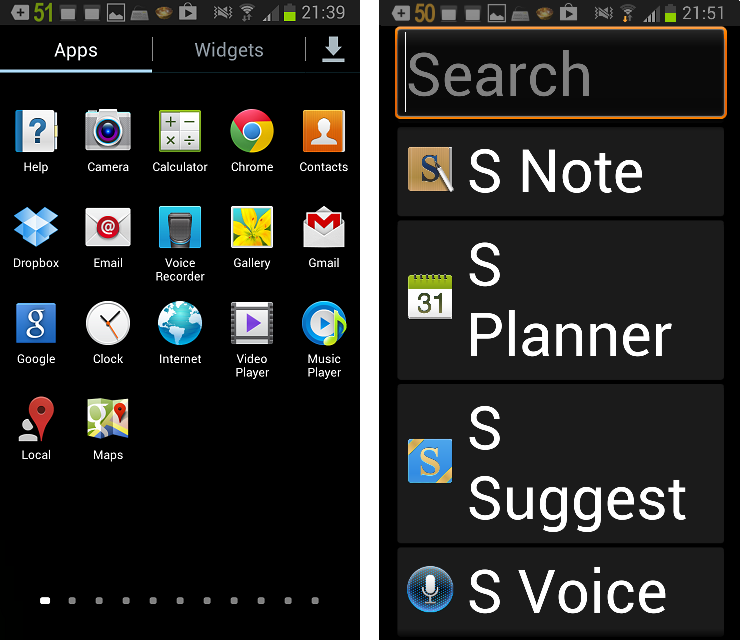 Big Launcher gives you large icons and large print (up to 25pt) list of your apps, contacts, phone calls, text messages and the option of an SOS button. It’s the largest print launcher I’ve found. This Post was tagged accessibility, android, large print, Launchers. Bookmark the permalink. Well, I’m used to widgets (calendar, large clock, weather, etc., where Big Launcher can’t serve me my needs. So Big Launcher is on my device used for making phone calls, while the device used for other tasks is using Apex Launcher, and I have the screen magnifier gesture enabled if I need occasionally enlarge a part of the screen (equivalent of pulling a lens for the same purpose). Hi Tomáš, Although Big Launcher can do 1 x 1 widgets (or larger widgets it scales back to 1×1 – it doesn’t always work out), you are right, it would be nice to be able to have larger widgets. I am working on a followup post on that topic shortly you might be interested in – In the meantime, have a look at Lightning Launcher by PierroX – Its setup menu isn’t any larger than standard, but you can pinch zoom in on the home screen itself, and with a bit of setting up, you can have it setup to 2 x 3, 3 x 4 or any number of icons or widgets to fill a screen and look similar to Big Launcher (without the large print dialer or messaging etc – for those, off the top of my head, checkout BigDialer by BX Mobility and Big Text SMS by Septium).